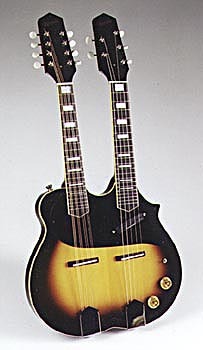 A vintage style electric mandolin featuring a sunburst finish, block inlays, and a bound top and fingerboard, JUNIOR DELUXE has a mahogany body and spruce top, combined with a Seymour Duncan mini-humbucker pickup to deliver a warm, fat tone suitable for jazz, blues, country, or rock music. A hollow tone chamber enhances the low and mid range of the instrument, giving it a guitar-like quality while still retaining that tuned-in-fifths sound. JUNIOR DELUXE is available in 4, 5 or 8 string models and can also utilize an EMG bridge transducer for a more “acoustic” sound. The double neck, JUNIOR II, is also available with an 8 string acoustic/electric neck and a 4 or 5 string solid body electric neck (see Custom Instruments).